A few years ago, Tracy wrote about her tooth fairy conundrum, but it wasn't until recently -- Laurel is 6 and eagerly awaiting the loss of her first tooth -- that I started suffering my own angst on the topic. Since most of Laurel's friends have already lost teeth, she keeps asking about the tooth fairy's going rate (and, um, she knows that we are the tooth fairy). And quite frankly, she keeps horrifying me, telling me what her friends are getting. So a couple of nights ago I turned to Twitter and Facebook, and decided to map out some hard data for my own, and your, purposes. As context, I should say that as a kid, my parents didn't do tooth fairy duty. Usually my older siblings filled in and the gifts were usually a quarter or a used (as in, pieces of it were already cut out) Ranger Rick magazine. And I was happy. It was all so simple. But this past weekend I heard rates starting at $3 but averaging around $5-10 per tooth. And to respond to some of the queries I received on Twitter, no, it's not because I co-mingle with high society in a wealthy Boston district or suburb. In fact, when I tell people where I (very happily) live, usually their first (rather clueless) question is, "Aren't you worried about the schools?" I love our community of parents here -- they're cool, reasonable people who I don't consider overly materialistic. Nevertheless, these rates seem out of joint. And I also acknowledge that this issue is tweaking a deeper nerve in that I feel as if Jon and I are raising Laurel to be reasonable in her wants and aware that so many people have so little. So when I hear her complain when I say that the $5-10/tooth rate is absurd, I fear that she is becoming greedy or spoiled, or will become one of those kids who used to taunt me for not owning Guess jeans in middle school. Realistically, I think Laurel's response is probably age appropriate -- she's hearing things on the peer circuit and it feels unfair to not receive the same. About 50 people responded with a flat rate per tooth, ranging from $0 - 5, with an average tooth rate of $1.15 (standard deviation = $0.96). About 20 people responded with a varied rate per tooth: a higher value for a first tooth or molar and then a lesser amount for all following teeth. 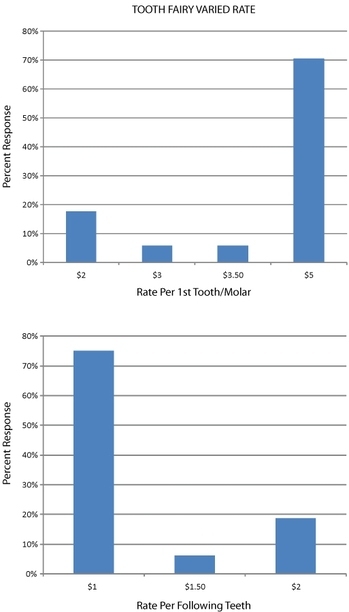 For the first tooth or molar, the rate ranged from $2-5, with an average tooth rate of $4.26 (standard deviation = $1.23). 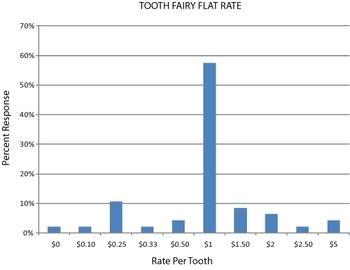 For the subsequent tooth rate, the rate ranged from $1-2, with an average tooth rate of $1.22 (standard deviation = $0.41). There was one outlier I couldn't quantify in these buckets due to the variable nature of the data. This respondent offers a dollar amount equivalent to the age of the child. So, if the child is 8 years old, the going rate is $8/tooth. Many respondents said their kids responded favorably to the special nature of a dollar coin. A few others said their kids didn't understand dollar coins (i.e., equated a dollar coin as a lesser value, as with quarters and nickels) and dollar bills were better. A few respondents indicated leaving pixie dust under the pillow in addition to coins. I'm embarrassed to say that I have no idea what that even means (and Laurel is really into fairies). A few respondents indicated leaving a book or craft instead of money. I love this idea (for us, maybe for the big molars) and for some reason it doesn't seem as crazy as leaving $5-10 under the pillow, even though the amount would be similar. One respondent cleverly responded that she solved the comparison problem with foreign currency (1 tooth = 1 pound coin). So there you have it. If your kid asks what the tooth fairy's going rate is, you now have data from the (Unofficial) Tooth Fairy Association. When I first started thinking about this topic, instinctively, $1 per tooth seemed reasonable to me and I will take the above data as validation. And maybe we'll do a small book or craft when the molars come out; I'm hesitant to do anything big for the first tooth so as not to set a precedent. Once a scientist, always a scientist apparently.